If the circuit fails to work at all, it is most likely due to a power supply fault. or a short circuit. Once these possibilities are eliminated, check the action of the active on/off switch and the pots. 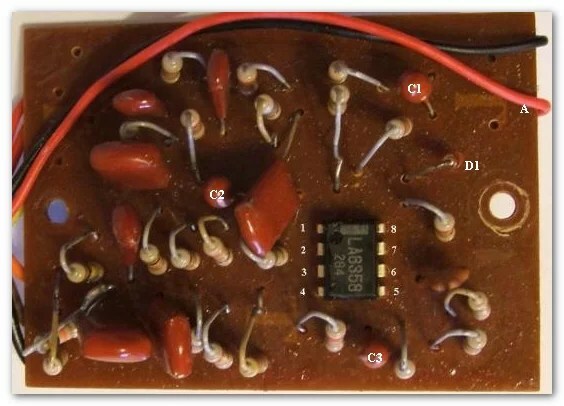 The components on the PCB are all operating well within their normal parameters, it is unlikely that any will fail, however capacitors can leak as they age. With a lead plugged in to the guitar check the voltage between pins 4 and 8 on the op-amp, using a multimeter set to a 20V range or higher (Negative lead to pin 4, positive to pin 8). With fresh batteries in, you should get a reading of about 18 to 19 volts. If you do, go on to the next section. If you don’t, there is a power supply fault. 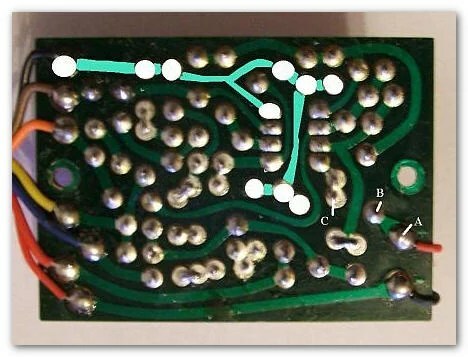 The diode connects across points B and C below. 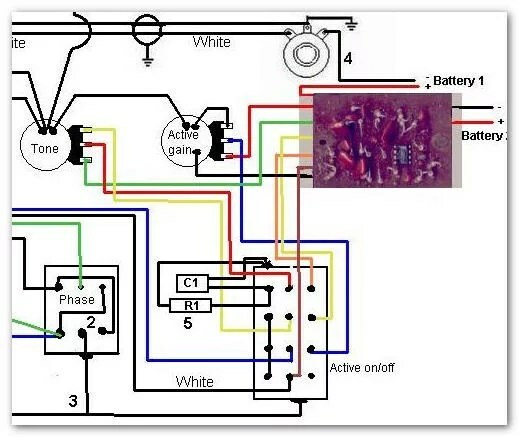 Plug the guitar in and check the voltage at point A, it should be the full battery voltage. Check point C, the voltage should be slightly smaller. If there is a reading at A but not at C the diode is faulty. Replace it with another (Use a 1N4148) or a wire link since the diode is not strictly necessary. If you do not get a voltage reading at pin 8 or point A, check the continuity of the battery leads and that the battery negative connects to earth when a jack is inserted. These tests should be conducted with the guitar unplugged and the active on/off switch in the on position. Check the resistances between the wires on each pot. These readings are taken from my Thunder IIA, due to the varying tolerances of components your readings should be within plus or minus 10 per cent of these figures. If any of those connections does not show zero resistance the switch is either dirty (Try switch cleaner) or faulty and should be replaced.